MamaEatsClean: Wow - A Grain Free Vegan Pizza Crust the Whole Family Can Enjoy! 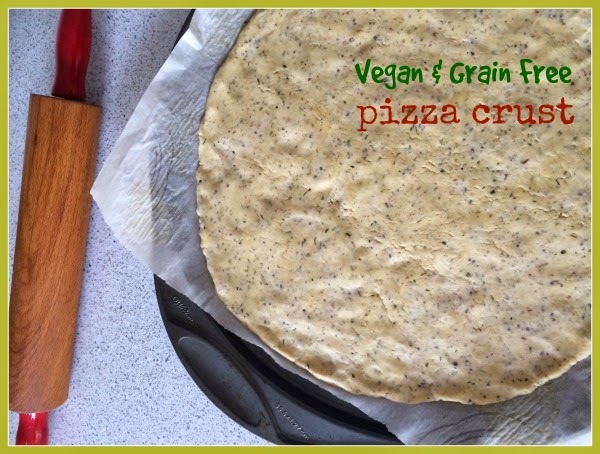 Wow - A Grain Free Vegan Pizza Crust the Whole Family Can Enjoy! This pizza crust has made me very happy..............a pizza crust the WHOLE family can 1) eat - yay - no eggs, dairy or grains and 2) enjoy. Even my hubby loves it. My gluten-dairy pizza loving hubby! But I have still been cooking and sticking to my diet (no grains, no diary and low sugar) since it works for me. I don't experiment as much as I used to but I did play with this pizza crust recipe that I got from Primally Inspired to make it vegan and to work for my families tastes. It is incredible given all the restrictions. I've tried several pizza crusts since changing my diet. I loved pizza crust #1 from the Wheat Belly cookbook but, unfortunately, that one contains dairy and eggs. Since I no longer eat dairy and my daughter doesn't eat eggs it didn't last long. I've also experimented with cauliflower crust pizza on several occasions and it never worked for me. Well, I've made this one now at least 5 times and it seems to be fail-proof. Consistent. Delicious. I'm pretty excited about this recipe. So I thought I better get blogging and get this recipe in the archives.......because I think we will be eating this for years to come. PIZZA NIGHT IS BACK BABY!!!!! If you don't eat dairy and you are wondering about toppings, I usually use a combination of Daiya (non-dairy cheese) and nutritional yeast for my kids. For myself I usually use a combination of goat cheese and nutritional yeast. I find the goat cheese goes better with non-traditional toppings so I like to use a sun-dried tomato pesto for the "sauce" and toppings like chicken, leafy greens, cilantro, red onion or whatever happens to be in the fridge. Its pizza. You can't go wrong. I hope you enjoy this recipe! Looking forward to catching up soon! In a mixing bowl, combine your flours, spices and nutritional yeast. In a small pot bring the oil, broth or water, apple cider vinegar and minced garlic clove to a low rolling boil. Just let it boil for 1 minute or so before removing it from the heat. Let it cool for a few minutes. Add boiled mixture to flour mixture and mix thoroughly until fully combined - it will be really thick and pasty. Don't worry if its not completely smooth. Add in the water/Chia/flax mixture. Stir well. Add in your coconut flour. Stir to fully combine. It will start making a dough as the coconut flour absorbs the moisture. I find it best to take it out of the bowl and gently kneed it on a piece of parchment paper. It should form a ball. I use a rolling pin to roll the dough out on the parchment paper. I usually make it about 12 inches in diameter. I then transfer the dough (on the paper) to a pizza pan. I bake the crust for about 10 minutes. Then I remove it from oven to add toppings. Depending on the type of toppings I usually bake it for an additional 8 - 10 minutes and then use the broiler to crisp it up for 2 minutes.